For thousands of home owners on any given day, Vapor Barrier is a resource and guidance platform to help you learn everything you need to know about crawl space vapor barriers. 20 vapor barriers are the most sought after thickness for encapsulating the crawl space. While most of these crawl space vapor barriers claim to be 20 Mils thick (.020 inches) they actually fall short if you were to measure the actual plastic. To get the most bang for THEIR buck they measure the vapor barrier at the thickest point; that would be on top of the string reinforcement. Some measure where the strings cross in order to cut the amount of plastic used in the film and still show 20 Mil in their pictures. A true 20 Mil crawl space vapor barrier is about half as thick as a dime. The best way to identify a true thickness 20 Mil vapor barrier is to look at the products weight. In the polyethylene film industry the weight is measured in pounds per 1000 square feet or MSF. A true 20 Mil will weigh in at about 109 MSF, thats about 5 pounds of plastic per Mil. Besides the SilverBack™, some of the other brands on the market like CleanSpace™ weighs in at 83 MSF and NT 2000 at 74 MSF. The 20 Mil SilverBack™ weighs in at 109 MSF. In fact, Mr Leech says that is why the largest roll of 20 Mil SliverBack™ is only 90′ long because it is to heavy for UPS to deliver at 100′ or 151 pounds. Since a 20 Mil vapor barrier is the most sought after; Why would anyone offer a 12 Mil crawl space vapor barrier? We sought out the top crawl space repair experts in the industry. That lead us to Crawl Space Repair LLC. So what is the break down on the 12 Mil products? You guessed it, a wide variation of what companies call a 12 Mil. The SilverBack™ comes in at 65 MSF (pounds per 1000 sq ft), while at the other end the NT-1200 weighs in at only 38 MSF. The SilverBack 12 mil vapor barrier and 20 mil vapor barrier are both top of the class in the vapor barrier markets. The SilverBack brand is the most reviewed crawl space vapor barrier in the world. That doesn’t just happen for no reason, it’s because no other vapor barrier compares. The top 2 reviewed crawl space vapor barriers are the 12 mil vapor barrier and the 20 mil vapor barrier belonging to the SilverBack brand. Just Google it! Less than or equal to 0.1 perm. Greater than 1.0 perm but less than or equal to 10 perm. As the crawl space repair industry grows and the demand for a vapor barrier to hold up in the crawl space environment grows with it, we are seeing more and more companies become “experts” to get in the action. 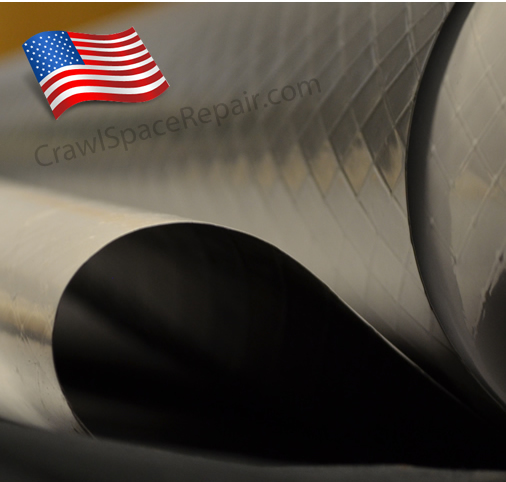 Over the last decade, engineered films designed for a specific purpose have found their way into the crawl space industry simply because it was accessible and not because it was the right product. IIt’s an industry problem homeowners need to be aware of. All crawl space vapor barriers are not created equal. Plastic sheeting is not an option for the crawl space, it’s not designed for it. Rather, you need a vapor barrier designed for the crawl space. Most all vapor barriers or liners are manufactured for a purpose and some even for a general purpose. For example, 6 mil construction plastic, it’s made to be cheap and temporary but for a wide range of uses. It is usually made from recycled plastic and is the most competitively priced product on the market because it is sold at nearly every home improvement, hardware and lumber store across the country. At the other end of the stick is reinforced construction film. There are many different versions of this product that meets the different purposes. For example, 6 mil reinforced clear, is used in the construction of high-rise buildings as a wind break for the people working from scaffolding. It is also used as a “safety net” to protect people on the lower levels of scaffolding from falling bricks, tools and anything else falling from levels above. In the case of the 6 mil construction plastic, manufacturing costs are a huge factor in market price competition. When it is made from recycled plastic it will contain all of the additives and impurities that were in the original “source” product. This matters because, well, no one really knows what is or could be in it. Remember this product is meant to be temporary. Now, with the 6 mil reinforced film made to be used as a wind break, this product does have additives in it by design. You will find fire retardants and UV inhibitors along with other OSHA required properties. Additives like fire retardant do not simply make something fire proof, but rather trade the flame spread (how fast it burns) for smoke development (amount of smoke produced). The fire retardant suppresses the flame it does not make it fire proof as it is so often marketed in the crawl space world. When a product is used outdoors, for a wind break, the smoke development can be much higher than for an indoor application. What this means is, the wrong fire retardant recipe can and often does make the plastic more dangerous in a fire situation when used indoors. Many other additives used alone or in combination will give the film an odor. Most likely an odor is what a homeowner is trying to fix. 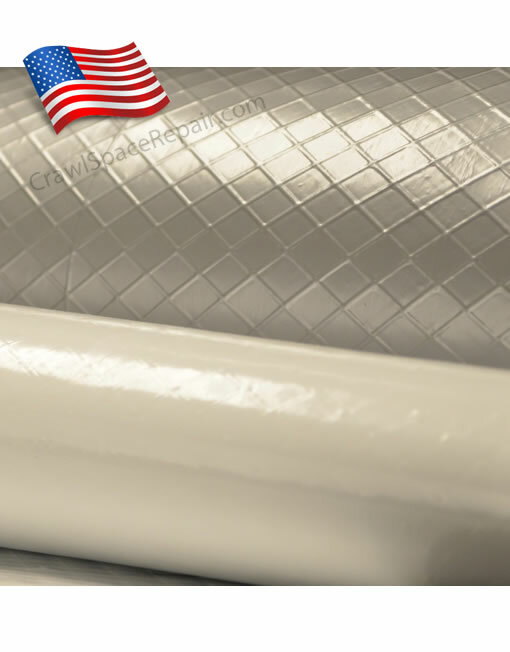 There are a few companies in the crawl space repair industry that know this and manufacture crawl space vapor barriers to be used in the crawl space. You will find that the SilverBack™ brand is a clean additive free reinforced plastic liner that will give years and years of service in a crawl space.